It's the politically correct way of saying “So, how much money DO you make?” Sometimes, it's rude. Sometimes it's a shabbily disguised question of your authenticity. And sometimes it's a last ditch effort of someone looking for hope and inspiration. 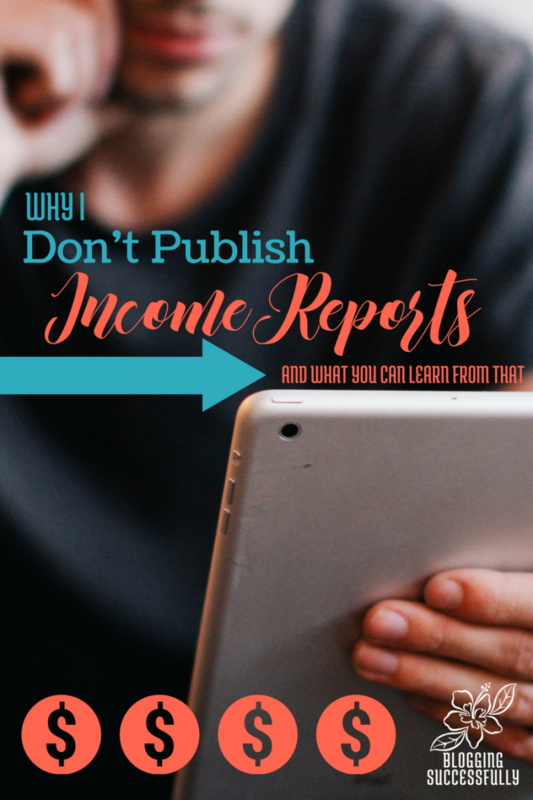 Either way, I thought it was time to explain why I don't publish my blogging income reports publicly. Watch the video or read the highlights below. Let me preface this by saying, these are our reasons, my husbands and mine, that we have set based on our unique situation, platform and business code. You may disagree, and that is fine. You may have other reasons to share or not to share your earnings information publicly, and that is fine. These are an explanation of what we do, not a rule to govern the masses. It's how we were raised. Your income and expenses are nobody else's business. Sharing income reports with the world opens doors to all kinds of situations we would rather not deal with, especially in the culture in which we currently live. Our success (as defined in the video above) is not dependent on a number in the bank, but on the investments we make in others. #IRLConnectionsMatter. People are more important than profit. While some see public profit reports as inspiration, they can very easily be misconstrued as pride, competition or basis for comparison. We believe strongly that EVERYONE has a unique and needed message for a unique audience, and while your sphere of influence may overlap somewhat with that of another, you are SO different, that it is unfair to you, and to the other person, to your audience and to your Creator God to compare yourselves. The trend for publishing income reports is not new. And if you follow blogs like Smart Passive Income or Pinch of Yum, you can see how long they have been doing it and, even better, study their growth patterns over time. That is the real value in income reports. It's not the numbers. It's the strategies, activities and source information about where the income comes from that is valuable. Consider the niche, the list size, etc and then look at the activities that produce an income and see how you could further diversify or streamline your efforts for a better ROI (return on investment). It is also helpful when people share what they have learned from their income strategy, like Pat Flynn does. And you must keep in mind that income and profit are two distinctly different words. Income includes all monetary or in-kind value received. Profit is the amount of money left over once all expenses (hosting, mail service, virtual assistants, advertising, etc.) have been paid. Thanks for sharing. I’ve never been comfortable with the idea of sharing my income either. While I know it can be inspirational and there is much that can be learned, I think it can also lead some people to feel as if they’re failing if they see their numbers as not matching up. Inspiration is awesome, but comparison is poison. There are other ways to encourage and inspire without having to reveal the numbers. Thanks so much for your comments, Kelly. I appreciate it.